The elusive terrorist meets his demise this January on Blu-ray. 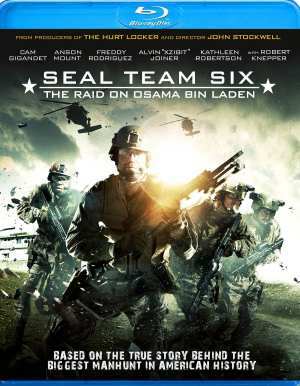 In an early announcement retailers, Starz/Anchor Bay is preparing 'Seal Team Six: The Raid on Osama Bin Laden' for Blu-ray on January 8. Based on true events, framed by real-time footage, 'Seal Team Six: The Raid on Osama Bin Laden' recounts the dramatic behind-the-scenes decisions that brought the world’s most wanted man to justice. Starring Cam Gigandet ('Burlesque'), Anson Mount (AMC’s “Hell on Wheels”), Freddy Rodriguez ('Grindhouse'), Xzibit ('Derailed'), Kathleen Robertson (The Starz Original Series, “Boss”), Eddie Kay Thomas ('American Pie') and Kenneth Miller ('The Company You Keep'), the feature-length film premiered on the National Geographic Channel on November 4th and the network’s most-watched World Premiere movie in 2012, drawing 2.7 million viewers. America’s very first look at the real story behind the historic manhunt and raid that took down al-Qaeda’s notorious leader, the events portrayed in 'Seal Team Six: The Raid on Osama Bin Laden' were vetted by a team of experts, including a recently retired Navy Seal, a top CIA operative, and one of the most renowned bin Laden historians. The Blu-ray will feature 1080p video, a DTS-HD Master Audio 5.1 soundtrack, and a making-of featurette. Suggested list price for the Blu-ray is $24.99. Hi , i live in belgium and my question is where can you buy this movie ? waiting when the film will be in Russian,becouse im live in Kiev,Ukrain<and im watchet trailer,he cool!!! !